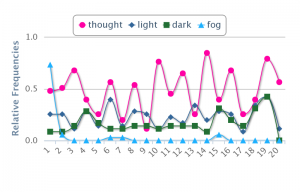 Voyant is an internet based tool that analyzes text in a numerical and graphical sense. Though it is fairly simple to use, Voyant offers endless number of ways to analyze one text. In our own analysis of Bleak House, we were able to input the text as a whole as well as by individual chapters and Esther’s narratives to give different perspectives to analyze the work from. can there come fog too thick, never can there come mud and mire too deep, to assort with the groping and floundering condition which this High Court of Chancery, most pestilent of hoary sinners, holds this day in the sight of heaven and earth” (Dickens, 5-6). Present in this imagery, beyond the “mud”, “mire”, and “fog”, is Chancery, which the fog appears to symbolize in regards to the institutional oppression of the court system and the misery it evokes, but also the confusion of the reader as they are being suddenly thrust into the story and the world of Bleak House “slipping and sliding” like the foot passengers on the streets of London as they try to get their bearings and find their grounding. 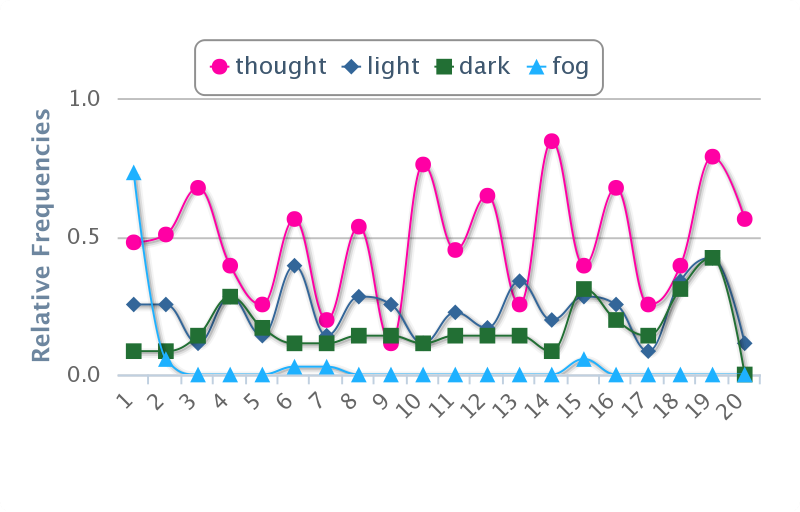 In contrast to the word “fog”, the words “light” and “thought” appear to run relatively parallel to frequency and form of the other as the novel progresses and become prevalent at higher frequencies than that of the words “dark” and/or “fog”. Because of this, we interpreted the decline of fog and darkness to be related to the end of the Jarndyce vs. Jarndyce court case and the increase of light and thought to represent greater clarity and the lucidity that the end of the novel brings to the reader and the story. Another option of looking at Bleak House using Voyant is by just selecting Esther’s narratives. 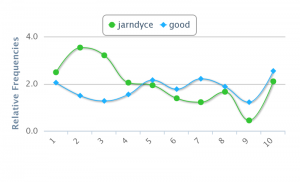 By choosing the words “good” and “jarndyce” within the selected chapters, Voyant will produce a visual graph that can aid in the interpretation of how Esther perceives Jarndyce with good. The chart illustrates the inverse relationship between how Esther relates good to Jarndyce. We as readers were confused by this outcome, as Esther certainly is grateful for Jarndyce’s generosity and enjoys his company. However, we also know that even though Esther cares for Jarndyce, she is not in love with him and views him more as a guardian, as she often describes him as, than an equal. Though she is a very complaint character, this inverse relationship could possibly be interpreted as a very passive form of Esther’s frustration towards her relationship with Jarndyce as she falls in love with Allan Woodcourt. 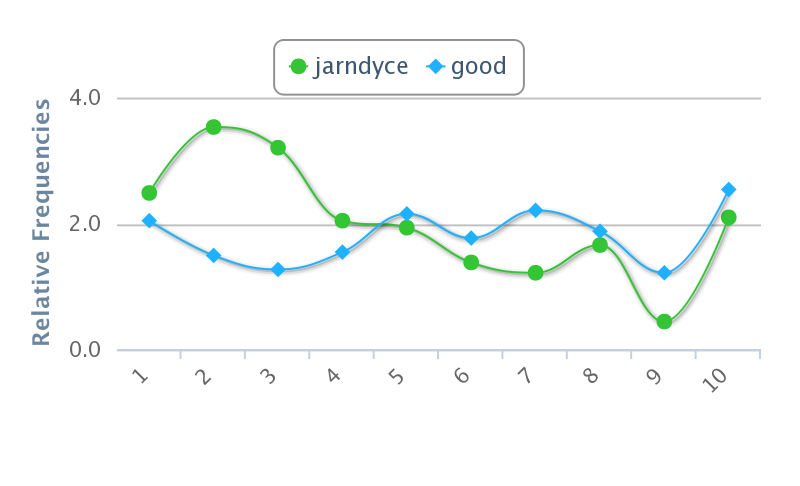 As the graph illustrates, the usage of “jarndyce” and “good” transform into a direct correlative relationship by the end of the nove.. This we associate with the change in Jarndyce and Esther’s engagement, as he releases her from their agreement to go be with Allan Woodcourt. 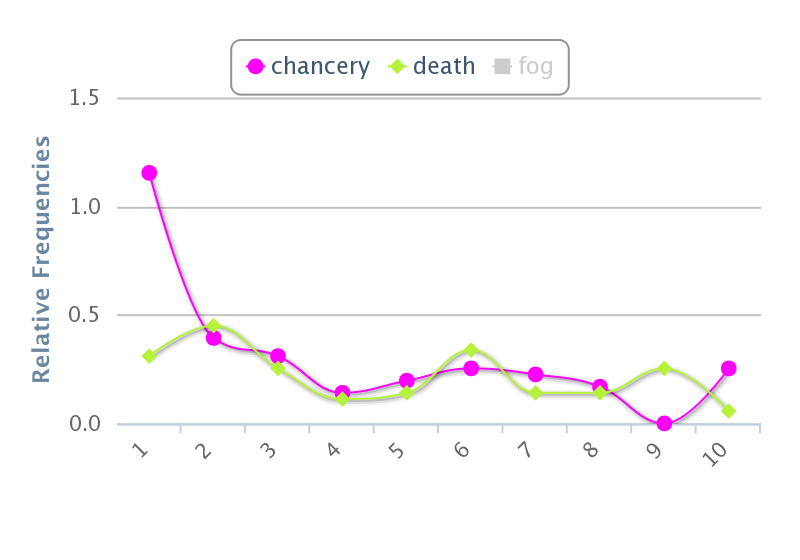 By comparing the use of the words “Chancery” and “death” we found another interesting correlation. For the majority of the novel, the relationship is directly proportional because the Court is stagnant and often lifeless. Naturally, the beginning of the novel contains the most uses of “Chancery,” mostly due the first chapter’s focus on the court’s machinations, or lack thereof. Both words are used fairly consistently through the “middle” of the novel, with small peaks and valleys occurring simultaneously. During this interim, interpersonal relationships take the fore, and the suit is mentioned sparingly. 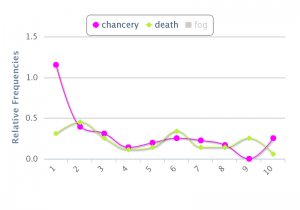 When the the suit finally ends and Richard dies, the correlation becomes inversely proportional; “Chancery” bottoms out and the usage of “death” increases. 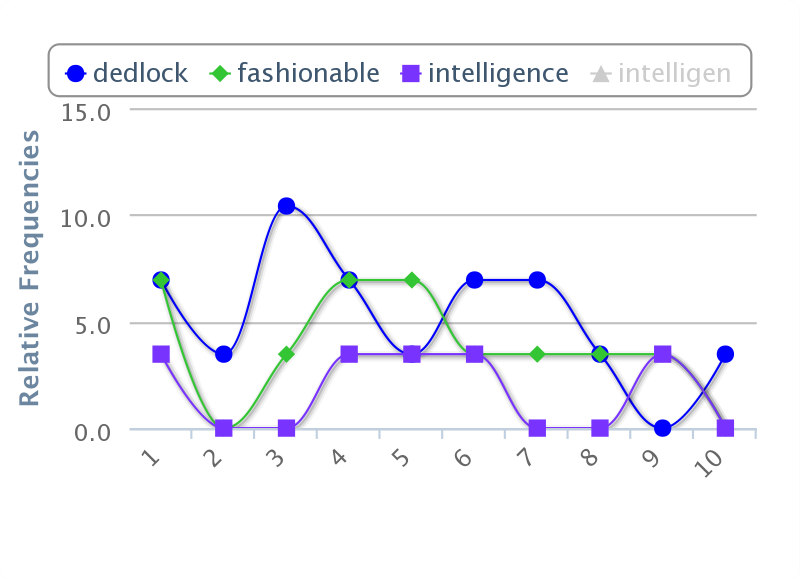 This chart details the relationship between the words “dedlock”, “fashionable”, and “intelligence” in the second chapter entitled “In Fashion.” The frequency of the words have an interesting pattern; we can see the data plateau for each of the words at some point in the chapter, and it occasionally correlates. In the beginning of the chapter, the Dedlocks are described alongside both fashion and intelligence fairly consistently. We can see that the curves for all three words have a positive correlation. At around the fourth segment of the chapter, both fashionable and intelligence plateau (the are used continuously and consistently), but Dedlock descends to the same level as intelligence. This leads the observer to wonder “why?” Is there a reason why the name Dedlock has the relationship with intelligence and fashionable that it does? At the parts of the chapter in which these plateaus and dips occur, Dickens uses words that refer to retention. At segment four in particular, the passage reads, “My Lady Dedlock, having conquered her world, fell not into the melting, but rather into the freezing, mood. An exhausted composure, a worn-out placidity, an equanimity of fatigue not to be ruffled by interest or satisfaction, are the trophies of her victory. She is perfectly well-bred” (Dickens). 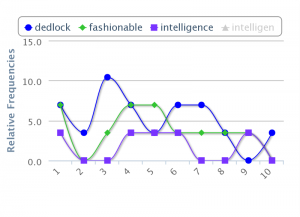 In light of both the graph and the text, one might conclude that the pattern of word usage is a reflection of the description of Lady Dedlock herself. This entry was posted in Uncategorized on December 12, 2014 by Angie Carson.